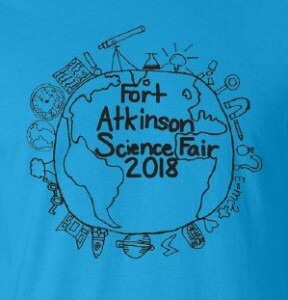 Each year the Fort Atkinson Science Fair, Inc. holds a T-shirt Design Contest. Any student living or going to school in the communities of Cambridge, Fort Atkinson, Jefferson, Johnson Creek, Lake Mills, Milton, Palmyra-Eagle or Whitewater is eligible to enter. One design will be chosen for the next year’s Science Fair t-shirts. Students may submit more than one design, but each has to be on a separate piece of paper. The student whose design is chosen will receive a free t-shirt and a $20 NASCO gift card. REMEMBER! Simple designs generally look better and are easier to print. Use BOLD lines – thin lines do not transfer well onto t-shirts. be on a sheet of 8″ by 10″ paper and be vertically oriented. include “Fort Atkinson Science Fair” and the current year in the design. include your initials (not full name) in the design. include your name, address, phone number and age on the BACK of your entry. must be black ink on white paper. The winning entry is chosen based on originality and suitability (in other words, how well it would look on an actual T-shirt.) Fort Atkinson Science Fair, Inc. reserves the right to slightly alter the chosen design if necessary. Entries should be turned in at the NASCO Retail Store at 801 Janesville Ave. in Fort Atkinson no later than November 1st. The winner will be announced on our website by the end of November. Designs will not be returned, but can be picked up after the Science Fair in February. Any questions can be directed to Amy Lutzke at (920) 222-6832.